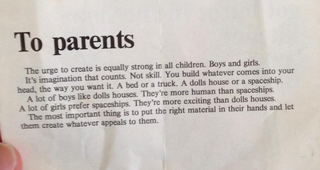 This photo of a note to parents, purportedly printed on a pamphlet included in a LEGO set from the 1970s, has been making laps around the Internet. The legitimacy of the note, which is noteworthy for its egalitarian tone, has been called into question – but we can now confirm its authenticity. UPDATE: LEGO has responded to our request for comment, and the note is authentic. See below for details. Pretty great, right? We think so, too. So do a lot of other people. But the legitimacy of the note has been called into question. "Not because the message is bad, but I'd be skeptical about the authenticity of this," reads one of the top comments from the original post. On Twitter, others have flagged the note's typesetting and LEGO logo as anachronistic. At Boing Boing, Rob Beschizza wonders aloud how likely it is "that Lego would have used a proportional Times-esque typeface—with such sloppy layout—in the early 1970s." Yes, the text is from 1974 and was a part of a pamphlet showing a variety of LEGO doll house products targeted girls aged 4 and up from the 1970’s The catalogue was included with select sets in the doll house series in 1974. The text remains relevant to this day – our focus has always been, and remains to bring creative play experiences to all children in the world, based on the LEGO brick and the LEGO system – ultimately enabling children to build and create whatever they can imagine. This is visible today across the entire product range from the LEGO Group – every LEGO product is based on the LEGO system and this creative building experience. As for the doubts raised regarding the note's font and layout, there's plenty of evidence that LEGO used Times-like font and sloppy typesetting in the 1970s. Whether boy or girl, LEGO sets no limits to the imagination. A girl builds a spaceship. A boy plays with the doll's house; because a dollhouse is human. Playing with a spaceship, however, is more interesting and exciting. But the important thing is that you get the right match material in the hands. Only then you can feel free to create and play. Its more recent gaffes not withstanding, LEGO has taken a number of steps as of late to bridge the gender gap in its minifig sets.